Ok just saw the deal quickly on CNN and I hope to write more when I have time. Possibly future reduced weapons grade material as this is a first step. To the critics remember this is a first step Rouhani can take back and prove toIran that their concessions were worth it. This makes more possible later. 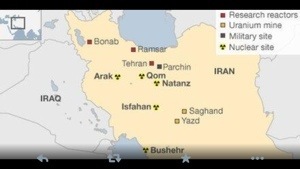 Without it Iran cod return to a more hard line stance. I am trying to be optimistic on this deal as the alternative is bleak. I know the Republicans are in a tizzy, but you are not going to get a complete dismantling on the first round of negotiations. Even Putin sees this as an important first step. To Israel and Saudi Arabia, you are just going to have to wait this out. The US has been placed in the lead here and here’s the first deal. If you don’t like it you are welcome to step up and offer your countries blood and tears. We certainly don’t need anymore at the moment. This is the first step and we can take a few days to look at the specifics. Contrary to the UNSCR’s it seems to legitimize Iran’s right to enrich, and that is a big change. Kerry and the Iranians are reading this differently, but now intelligence and oversight are crucial. I agree. Verification and inspections are crucial. Additionally, implementation and guidelines that come out of the agreement could vary by interpretation. 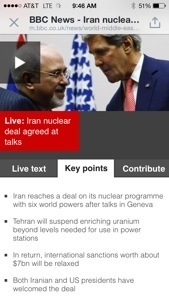 I am cautiously optimistic but willing to see what the reaction is on the Iran side.